Avoid drilling extra holes and making changes to the chassis and pcbs by all means. This will decrease the value of your amp since you will not be able to restore it to the original state anymore. Make sure to take pictures of the original state of the amp, so you are able to restore the amp back to a working state. I do not accept ANY liabilities for damage to your amp or to you. In the Ampage threads and at the PlexiPalace BBS I found some people recommending to bias Oranges at 32-34 mA. Amperex recommends about 35 Ma's per tube, but 30-33 if your plate voltage is over 560V. Frequently occurring in the US: the PT is not suited for todays Mains voltages. That is why the tubes get plate voltages that are way too high. The amp doesn't operate at the voltages it was meant to. This may cause early wearing out of tubes. There is also some arcing risk in Oranges which is certainly not improved by these higher voltages. Solution? Fuses blowing in the US: the voltage ratings on the back of the amps are for UK mains voltages (220-240Volts). Evidently the power consumption of the amp is the same no matter on what mains voltage it is running. Since power consumption equals mains voltage times drawn current, fuses in the US have to be rated higher than in the UK. Please link to this page, rather than post these schematics on other sites. I will make a difference here between schematics that are 1.official 2.well known 3.drawn up by friendly Orange fans and donated to this site. Graphic post'74 schematic NOTE: The rectifier diodes in this schematic are drawn incorrectly. 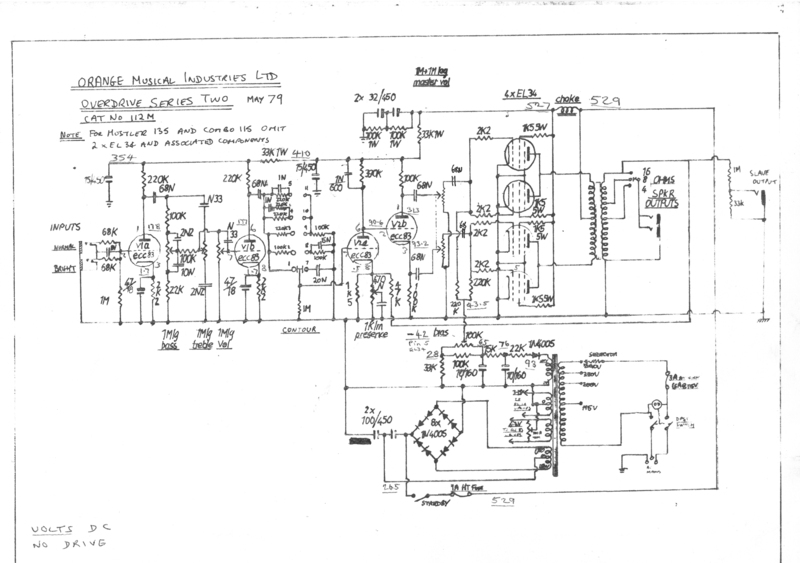 If you are building a clone or refurbishing an amp from this schematic, please follow the rectifier bridge section of one of the other 1970s schematics. These schematics were drawn up by friendly Orange fans. Please do not post these schematics on other websites without their consent. 1. Probably the best place to buy replacement transformers is Matamp. They sell replacement transformers as a set (PT, OT and choke). 2. Orange also sells the AD140 PTs as replacements for the 120s; they are a bit larger but are offered by Orange as excellent replacements for the 120W OTs. 4. Rubytubes is German shop that offers a OR120 replacement OT and PT. Follow "Produkte" and then "Ausgangsubertrager Orange 120" for the OT. Follow "Produkte" and "Netztrafo Orange 120..." for the PT. Prices seem reasonable. 5. Shinrock is a German replacement transformer manufacturer. He has reserved some space for Orange replacement on his sites but no products are mentioned yet. I will try to put some stuff here about what tubes make an Orange sound right. This is often a personal choice, so feel free to give your opinion too. I've tube the first channel with a 12AU7 for a cleaner sound and the second channel is a 12AX7. I've not had a single problem with it, it sounds great. It sits next to a 1968 JMI TB retrofit and they complement each other quite well. The Orange is signifigantly darker in tone with a rather tight low end. I've tried just about every damn tube configuration in it and it seems to like Mullard In the gain stage of both channels and Telefunken Smooths in the rest of the preamp stage. RCA el84's have sounded the best in the power half but their becoming harder to find so right now its got EI's in it. For the rectifier it has a NOS Philips that keeps the DC conversion quiet and smooth. WARNING!! MODIFYING ANY TUBE AMP INVOLVES OPENING UP THE AMP AND EXPOSING YOURSELF TO DANGEROUS VOLTAGE LEVELS!! IF YOU ARE NOT EXPERIENCED WITH THE PROPER SAFETY PRECAUTIONS FOR WORKING WITH THESE DANGEROUS VOLTAGE LEVELS, TAKE YOUR AMP TO A PROFESSIONAL TO HAVE THE WORK DONE. THE VOLTAGES INSIDE A TUBE AMP CAN KILL YOU IN AN INSTANT!!! THE DANGERS INSIDE A TUBE AMP ARE REAL AND THEY ARE SERIOUS! IF IN DOUBT, LEAVE THE WORK TO A PROFESSIONAL. Post '72 Oranges often have an extra resistor (220K) at the input. This resistor limits the gain and isn't really useful. 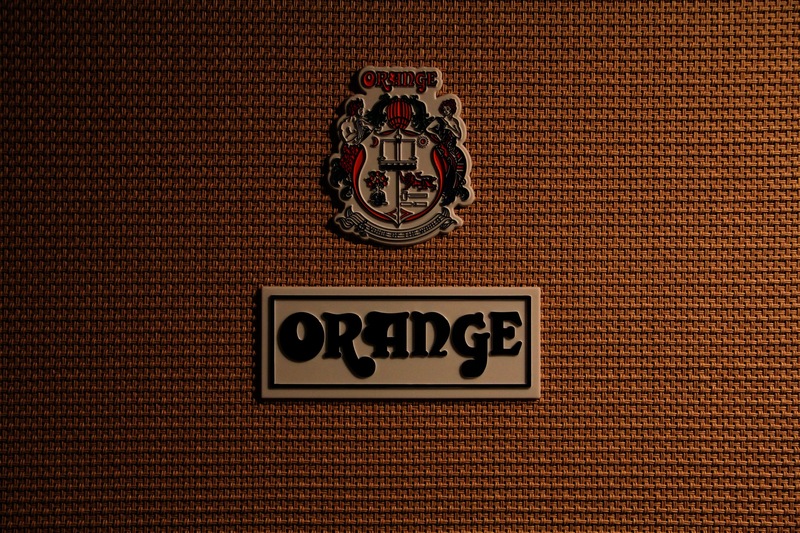 One of the most discussed mods to Orange amps is adding a standby switch, so it has to be in. All modern amps have 'em so it is definitely useful. For a good understanding: the standby switch enables your tubes to warm up before they get the full 500V on their plates. This increases the life of your tubes. Nevertheless to wearing of the tubes should not be exaggerated either. But if you only run NOS Mullards, it can be a useful option to put a standby switch in. DO NOT DAMAGE THE AMP BY DRILLING AN EXTRA HOLE. One suggestion I have read is the addition of the switch in the hole of the Slave Out jack(by Amperex). This way you can still restore the amp if wanted. Best practice: Remove the Slave Output (rarely used anyway). Put a DPDT switch in. Remove the connection between the High voltage secondary taps of the power transformer and the rectifier. Run two wires from PT to switch and two wires from switch to rectifier. Twist the leads and keep the wires close to the chassis to avoid hum. The older graphic amps all have a 1000pF capacitor in parallel with the plate resistor of the third preamp stage. This capacitor is meant to eliminate parasitary oscillations. However the amps mostly tend to function perfectly without this capacitor. Removing this capacitor also means removing extra filtering on the sound. The amps are reported to sound brighter after this modification. Tip: unsolder one end of the capacitor and put insulating tape around the loose end. This way you can resolder the component if wanted. Tested on my homebrew Orange: my amp had a clearer, less muffled sound. The cap stays out from now on! The classical Post Phase Inverter Master Volume setup as used in the Orange Overdrives(and also in various Marshall amps) adds some filtering of the sound of the amps. Since the original intent of the Overdrive amps with Master Volume was to have the Graphic sound at lower volume, we can consider this filtering to unwanted. There are alternative master volume setups that cause less unwanted filtering (or "tone sucking"). Amperex has tested an alternative by Ken Fischer. The simplest way to explain this setup: convert your overdrive back to a graphic schematic but replace the two bias feed resistors by a 250K double pot. Tested on my homebrew Orange: works fine, but I would advise to use a high quality double pot for optimum results. (what's a couple of euros/bucks compared to your hearing anyway?). Approved! "One more important point in reference to the orange circuits is that they changed the circuit in '74, and rewired the phase inverter. I suggest to anyone that has a '74 graphic or later, including the overdrive, to switch to the old circuit. It only takes a about a half hour to rewire it, and incidently Mike Soldano use to offer this mod when he was in L.A. and obsessed with Oranges. (he actually still offers it). It really makes the amp more punchy and responsive. The post '72 amps IMO can sound kind of mushy, not as dynamic as the earlier ones." The issue has come up from time-to-time that many of the early Orange amps (and apparently the reissue OR80/120 amps) have a power transformer winding that is designed for US wall voltages measuring in at about 115VAC, as they were in the late 1960s. The problem is that modern US wall voltage is closer to 125VAC today. The end result being a much higher voltage on the secondary of the power transformer - especially on the plate supply of the power tubes. The file below shows how to re-wire the mains transformer using the stock 115VAC lead as neutral and the stock 240VAC lead as the hot lead. The difference between these leads being much closer to the modern US wall voltage of 125VAC. This will bring the plate voltage back down to a more reasonable level as well as bringing the filament voltage closer to 6.3VAC which will make all of your tube filaments last a bit longer. These are a few Ampage BBs threads that might be useful for many Orange owners.